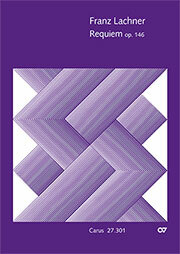 world premiere recording Franz Lachner’s Requiem in F minor was composed for the Mozart commemorative year of 1856. It is an expressoni of his admiration for Mozart, even though requiem settings of both composers have little in common. After almost 27 years of composing church works strictly in a cappella style, Lachner’s Mass for the Dead represents a milestone and an exception in his creative output. The choice of a large orchestra for the Requiem led to the consequence that performances conducted by Lacher took place not in a sacred setting, but rather in a concert hall. A special tension arises from the contrast between the large orchestral ensemble, which only reveals its full effect in a few dramatic passages, and the rather introverted mood which prevails throughout most of the work. Under the direction of Hermann Meyer, the Kammersolisten Augsburg has devoted its energies to discovering rare and forgotten works. 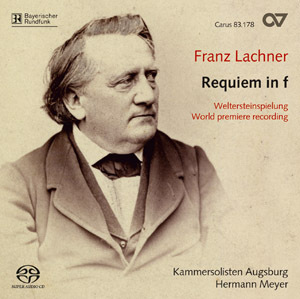 Thus this world premiere recording of Lachner’s Requiem enriches the repertoire of requiem settings with an important and exciting work in the genre. [...] Eine tief empfundene Komposition, die es wert war eingespielt zu werden! Diese Musik will nicht drohen. Franz Lachners kaum bekanntes f-Moll-Requiem op. 146 ist ein Fest der Lyrik, eine Quelle der Zuversicht. Ein inniger, warmer, gefälliger Ton prägt jene Totenmesse, deren Anlass Mozarts 100. Geburtstag anno 1856 war. Bisweilen glaubt man Reminiszenzen ans Requiem des Salzburgers zu erkennen. Doch in der lyrischen Grundhaltung und als Kontrapunktiker ging der wie sein Schüler Josef Rheinberger in München wirkende und auch ästhetisch mit dem Liechtensteiner vergleichbare Lachner (1803 bis 1890) eigene Wege. Die Wiederentdeckung lohnt sich. Mit dieser SACD legen die Kammersolisten Augsburg unter Hermann Meyers Leitung die gelungene Weltersteinspielung vor. Ein schönes Werk - nicht nur bei den Bratschenlinien im "Lacrimosa". Mehr Trost als Trauer.